The 9 in. precision-engineered INOVA T5 projects a powerful beam up to 928 ft. Powered by 3-123A lithium batteries, it has a patented optical system that provides thermal management while harnessing and projecting a powerfully bright (1075 Lumens) uniform focused spot with flood beam. Engineered with the professional in mind, the T5 has a tactical mid-body switch that activates constant and momentary high, low, strobe, and variable dim modes. It has a precision machined, aluminum body from solid tubular stock with a military-spec Type III hard coat anodized black finish and an aggressive knurling pattern for positive grip. Tbook.com crawls the web to find the best prices and availability on Flashlights and related Tools and Hardware products like Nite Ize INOVA T5 Tactical LED Flashlight in Black. For this page, related items include products we find that match the following keywords: "Flashlight" at our vendor partner Home Depot. 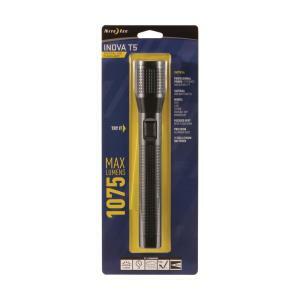 Nite Ize INOVA T5 Tactical LED Flashlight in Black is one of 152 Flashlights and related products listed in the Tools and Hardware section of Tbook.com If you have any questions on this product, please give us a call at 734-971-1210 during the hours of 9am - 5pm EST for assistance. Thank you for shopping at Tbook.com, the Internet Department Store!